This article is for admins and campaign managers. If you're a buyer, follow this article. Lead Campaign is a set of buyer configurations created in PX platform in order to start a lead flow between particular publishers and buyer. All campaigns are easily scaled across all verticals. 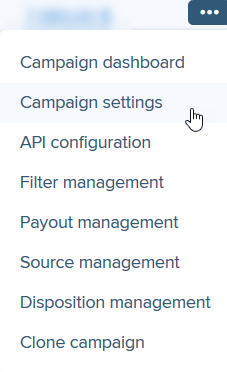 To view and edit settings of the existing campaign, go to Campaigns, find the desired campaign and click Action -> Campaign Settings. To make changes, click Edit. General settings describe basic configurations of the campaign, which are further used in API configurations. 1. Buyer shows the name of the buyer to which this campaign belongs. 2. Campaign ID shows the unique ID of this campaign. 3. Category - select Lead category. 4. Vertical - select a vertical for this campaign. 5. Campaign name - enter the name of the campaign. It is recommended to combine Buyer Name and Vertical (e.g. BuyerNameAuto) in order to keep data organized and simplify the support process. Avoid special characters. 6. Sales model - select the sales model for the campaign (None, Exclusive, Shared, Undersold, Mixed). 7. Post type - select the type of lead posting for this campaign (PING POST, DIRECT POST, BULKPOST, EMAILLISTPOST, LEGDELIVERY). 8. Country - select a country for this campaign. 9. Currency - select currency in the dropdown list. 10. Leg name - enter a unique leg name avoiding special characters (mandatory field for shared and mixed campaigns). It is recommended to use letters. Avoid using buyer campaign ID as a leg name, otherwise, it won't be processed correctly. 11. 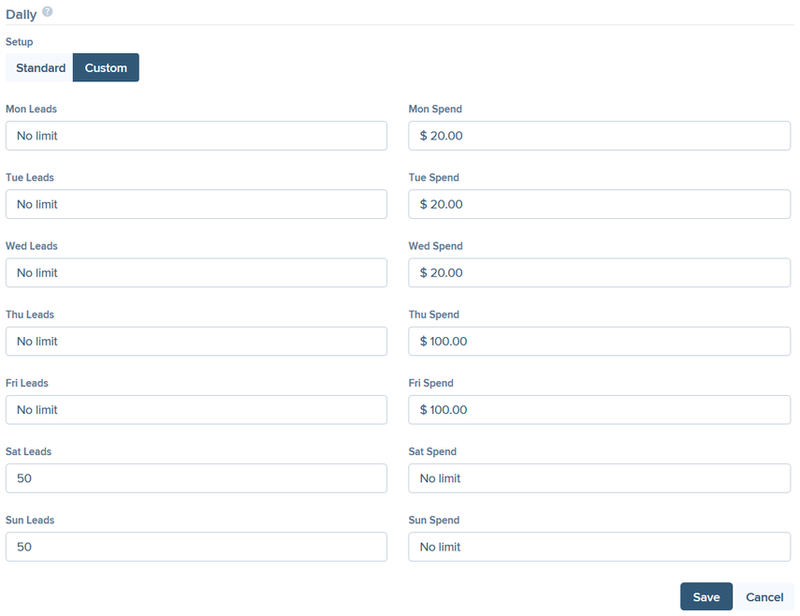 Hashed leg name - enter hashed leg name according to the agreement with the buyer (optional field for shared campaigns). Leg name and Hashed leg name fields aren't available for exclusive campaigns. Published - this campaign is enabled and receives the Leads. Prepublished - this campaign is Off in Source Management. Deleted - select to remove the campaign from the list of campaigns. When you select Deleted status and click Save, this campaign is automatically excluded from the leads flow. If you've deleted the campaign by mistake, please contact our Support Department to restore it. 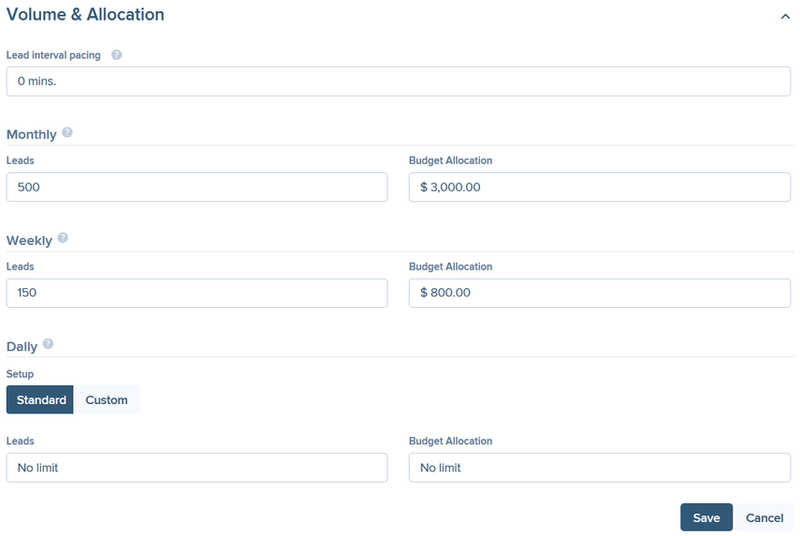 Commercial settings describe financial configurations of the lead campaign. 1. Tier - assign the buyer campaign to one of the tiers (1, 2, 3, 4, 5 or 0). 2. Duplicate prevention - the number of days, for which a duplicated lead cannot be offered to this campaign (30 is recommended). 3. Max lead returns - the maximum possible percentage of lead returns. For example, 10% means that not more than 10 of 100 bought leads can be returned by this campaign. 4. Inc LR in payout quality (%) - the percentage of how lead returns should affect the Payout Quality calculation. For example, it is set to 50%. Then, if Lead Returns is 10%, the Payout Quality is calculated as 100%-(10%*50%)=95%. 5. Payout Quality(%) - the percentage of your confidence towards this campaign regarding payout obligations. Payout quality is a dynamic value. When each period is finalized, it's automatically recalculated based on lead returns from this campaign during the finalized period and Inc LR in payout quality setting. However, you still can set it manually according to your preferences. Payout Quality is used in the bidding process. For example, Buyer A has 100% PQ, while Buyer B has 95% PQ. If both buyers bid $10 for a lead, the bid of Buyer A is calculated as 100%**$10 =$10, and Buyer B’s bid is 95% x$10 =$9.50. In this case, Buyer A wins the lead. 6. Floor Payout - the minimum payout for one lead from this campaign. 7. Direct Bid - the price that the campaign is willing to pay for a lead using a direct post. It is recommended that Direct Bid is higher than Floor Payout. Quality section contains quality score configurations of the lead campaign. 1. Source quality ceiling - the maximum publisher tier to post leads to this campaign (Platinum, Gold, Silver, Bronze, Nickel, or Coal). 2. Source quality floor - the minimum publisher tier to post leads to this campaign (Platinum, Gold, Silver, Bronze, Nickel, or Coal). 3. Escore floor - the minimum Escore for leads posted to this campaign. 50 is recommended. 1. Lead interval pacing - the minimum interval, in minutes, during which the campaign won't receive any new leads after the previous lead was bought. 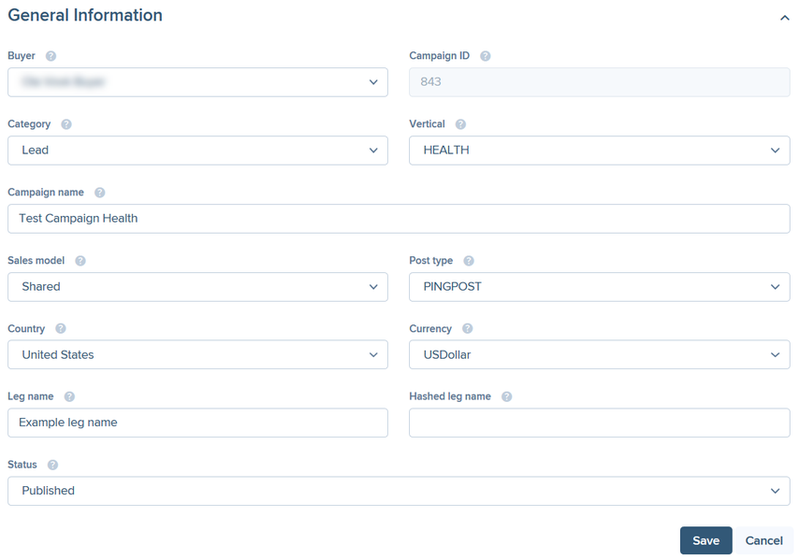 If the campaign doesn’t get the lead because of the interval configured, a transaction with Lead Interval Active buyer result will be displayed in Transactions Outbound Report. The next set of configurations is related to lead capacities and budgets for this campaign. By default, No limit is set for each lead capacity and budget. Considering that PX platform adjusts the lead flow to fill capacities of all campaigns in the platform, there can be a small infelicity in lead caps, meaning that campaign can receive several leads a day more (or less) than configured. 2. Leads - the maximum number of leads that this campaign can buy in one month. 3. Budget allocation - the monthly budget that can be spent by this campaign. If monthly lead capacity and/or budget is reached, leads are not posted to this campaign until the next month starts or this cap (budget) is increased. 4. Leads - the maximum number of leads that this campaign can buy in one week. 5. Budget allocation - the weekly budget that can be spent by this campaign. If weekly lead capacity and/or budget is reached, leads are not posted to this campaign until the next week starts or this cap (budget) is increased. 6. Leads - the maximum number of leads that this campaign can buy in a day. 7. Budget Allocation - the daily budget that can be spent by this campaign. If any daily lead capacity and/or budget is reached (either standard or custom), leads are not posted to this campaign until the next day starts or this cap (budget) is increased. The Goal is the specific disposition status of the lead that the buyer strives to reach (most often - Sale or Customer). Goals are configured on the campaign level together with the expected revenue received by the buyer when it is achieved. Read more about Disposition Goals. 1. Target CPA Status - set the desired lead status that matches the target acquisition of the buyer. To remove the goal, select None status. Target status names may vary per vertical according to settings on Disposition Naming page. 2. Target CPA - set the target revenue the buyer expects to receive when the goal (specific lead status) is reached. This section allows you mapping publisher ID and DID (Data Provider ID) in order to enable passing DIDs for the particular publisher and campaign pair. DID (Data Provider ID) is the phone number received from call tracking partners like Invoca or Dialogtech, through which publisher can send the call to the campaign using Selected Buyers flow. One campaign can be mapped to several publishers, but each campaign and publisher pair can be mapped to only one data provider. To start mapping, click Add DID and select the desired publisher in Publisher ID drop-down list (only publishers with Transfer Datapost type are available for selection). Enter the corresponding data provider ID received from call tracking partner in Publisher DID field, and click Create. Enter another value and click Save, or click Remove -> Yes to delete the DID. If you map the publisher that has already been mapped to this campaign, the old DID will be automatically replaced with a new one.